120 min. Warner Bros. Pictures Distribution. Director: Roman Polanski. Cast: Harrison Ford, Betty Buckley, Emmanuelle Seigner, Djiby Soumare, Dominique Virton. Roman Polanski's ode to Hitchcock, Frantic, resists succumbing to hype, and even resists the visual flash by which the Master of Suspense became so well-known. Rather, Polanksi curiously and effectively weds the unlikely adventure of a thriller to the plodding realism of daily life, and in doing so, Frantic achieves a kind of anxious tension to which Hitchcock no doubt would have tipped his hat in respect. Frantic most obviously recalls the plots of Hitchcock's The Lady Vanishes and The Man Who Knew Too Much, concerning as it does the disappearance of a woman and the scramble to find her. Harrison Ford stars as Dr. Richard Walker, an American in Paris, with his wife Sondra (Betty Buckley) in tow, to speak at a medical conference. The film's early, purposefully mundane scenes are laced with meaning about the bond between Richard and Sondra and also the strains on their union. Like a cosmic message never to take that bond for granted, Sondra's sudden disappearance from their hotel sends Richard into a tailspin of paranoia, confusion and intrigue. A jet-lagged stranger in a strange land, Richard is further handicapped by not speaking the language; indeed, nothing is easy as he embarks on an adventure to follow the scant clues leading to Sondra (in this leg of the story, John Mahoney has a nice scene as a useless bureaucrat and Dominique Pinon pops up as a drunk). The story shifts into a higher gear when Richard stumbles onto the scene of a murder and subsequently pairs up with a beautiful but reckless drug smuggler Michelle (Emmanuelle Seigner) who unwittingly holds the key to Sondra's disappearance. There's a Maguffin involved, of course, and in another nod to the monument-obsessed Hitchcock, the Franco-American icon of the Statue of Liberty plays a cheeky dual role, as a tchotchke and backdrop to the film's climax. Ennio Morricone contributes the score, and Polanski and Gérard Brach the clever script (with an uncredited polish by Robert Towne). As ever, Ford helps to ground the action in believable, sweaty fear and anger, and the incongruity of seeing the all-American hero traipse all around Paris—and, disconcertingly, over its rooftops—adds to the film's odd appeal. Frantic functions as a thriller, but it's most interesting as an allegory of a mid-life crisis: one man's anxious, tantalizing rediscovery of spontaneity while running through a world he doesn't know to get back to the comfort of the one he does. 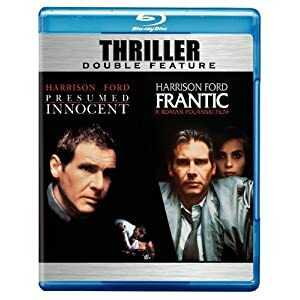 In inaugurating its line of Double-Feature Blu-rays, Warner has chosen Presumed Innocent and Frantic as a couple of the flagship titles. Presented on a single disc sans any extras, the double feature is a good value for two strong titles making their hi-def debut. The main strike against Frantic's transfer is that it can be flickery. That would seem to be a telecine issue for which Warner can be faulted; otherwise Frantic is presented in terms that are entirely faithful to the film's original appearance, one that evokes a rainy, colorless European day. It's a solid, film-like transfer of an aging film. In terms of audio, the disc keeps it simple: a DTS-HD Master Audio 2.0 soundtrack that faithfully renders the film's original audio soundscape with admirable clarity. All site content © 2000-2019 Peter Canavese. Page generated at 04/25/2019 03:13:00PM.